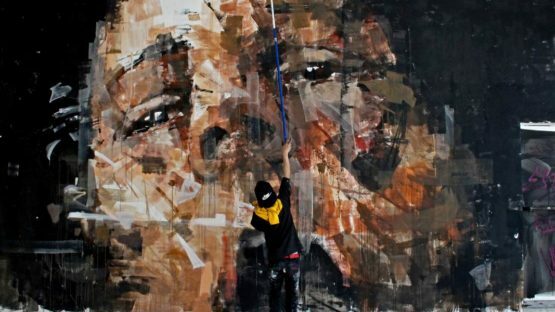 Jerico is a Filipino artist, stationed in Rome, Italy, known for his expressionist paintings and murals. His artwork is unique and distinctive, depicting primarily human faces with different expressions. Jerico was born in Rosario, the Philippines, in 1992. When he was 10 years old, he moved to Rome with his parents, which then became his city of adoption. He first got in touch with the street culture when he was 13, by creating graffiti in hidden and abandoned places and signing himself off as “Dekoner”. While in high school, Jerico develops a strong interest in the History of Art and he further studies several artists such as Van Gogh, Lucian Freud, and Francis Bacon, from which he takes inspiration. His first canvases are mainly portraits, either self-portraits or not. The most important project that involved Jerico, as well as others 19 artists, was the “Big City Life” organized by 999Contemporary in collaboration with ATER – Azienda Territoriale per l’Edilizia Residenziale and Comune di Roma in 2015. The project involved working on the side of a 14 meters tall building, home to more than 500 people in the TorMarancia neighborhood, one of Rome’s outskirts. In this event, finding himself painting not just for himself but for a collective group of people, Jerico’s artistic research further evolves. 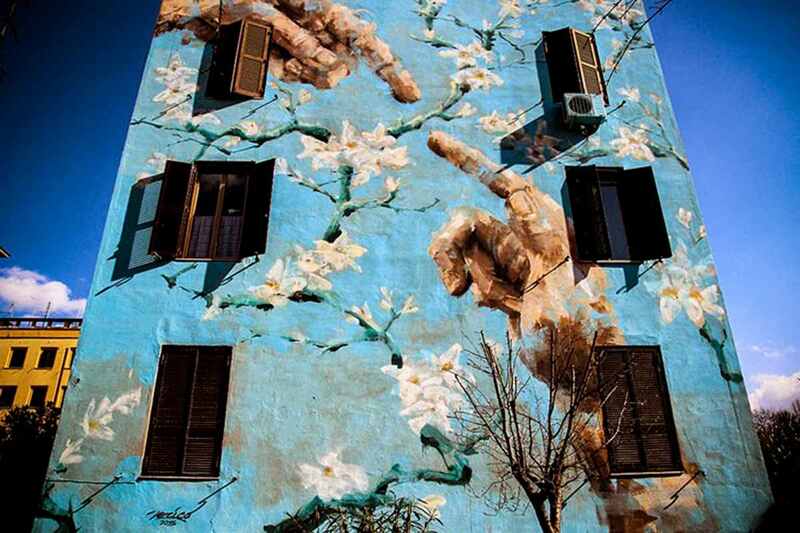 Titled ‘’Distanza Uomo-Natura’’ – Distance Human-Nature – the murals represent the new divine creation in which, between the Michelangelo looking touching fingers, there is a Japanese flower branch. There is no sign of restlessness, but serenity is diffused through the use of cyan color the background lets appear around itself. His works include fragmented faces, beaten expressions, scared eyes and screaming existences asking for help while inexorably dissolving. The viewer can’t do anything; there is no possibility of redemption. The souls are formed on the canvas and the spectator gets caught by them, feeling the darkness and the mystery in himself/herself meanders of the human soul. His research about portrait continues in the streets, creating both legal walls and ‘’Affissioni Abusive’’- Abusive Posting – a title of 6 posters illegally stuck on the walls of the historical working-class neighborhood Testaccio. In December 2014, he exposed for the first time several of his works in a collective exhibition called The Pitiless Gaze of Hysterical Realism at the Popping Club in the Monti neighborhood, a place famous for art galleries and enoteche (wine bars), found just to the east of the Colosseum. Jerico’s first ever solo exhibition, titled Fade to Blue, opened on March 12th, 2016 at White Noise Gallery in Rome. Jerico currently resides and works in Rome.